Fern Michaels has me tuning out everything to find out what The Sisterhood is up to next. Love the book....waiting for the next on in the series. BUY IT! I wanted to like this book, but the plot was very disturbing-how can anyone feel positive about a book that endorsed this kind of ending? Women who can outwit the government in this fashion? Yeah, sure. Everyone has a BMW? Yeah, right. 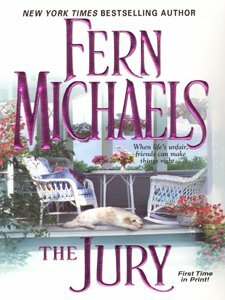 Fern Michaels', "The Jury" doesn't rest on the success of previous additions to the series. The old southern adage: "You wouldn't want to stoop to their level," doesn't help when your only answer is: "You want to bet." Ms. Michaels provides a vicarious experience and keeps her fans coming back for more. Nikki is suffering from guilt, even though she brought the members of the Sisterhood to her adoptive mother's attention; she feels the strain of an outsider. Now, her name has been chosen for the next revenge. Nikki believes her membership in the close knit group is under false pretenses as she has reunited with her life's partner without telling her friends. Taking a vacation, Nikki leaves her law firm in the hands of Allison Bank, a replacement for her beloved childhood companion. Allison betrays her employer for a chance at the big time, and the Sisterhood convenes. In the meantime, Paula Woodley, a Washington wife, is almost beaten to death by her husband. Now Nikki mission becomes twofold, defeat Allison and regain her life's work and help Paula Woodley put an end to the torture she has endured during her marriage.